My previous post explained the mechanics of the profit trap and ways to identify basis of competition shifts in the smartphone industry. My hypothesis was based on the distribution of customers across the spectrum of identity and utility, i.e. the identity-utility continuum. It may be worthwhile to delve a little deeper into the impact of utility and identity on consumer purchasing behavior and basis of competition. In retrospect, this post may have been better served as a "prequel" to profit trap mechanics. In order to understand the difference between utility and identity-laden products just compare the $6,000 Kia with the $120,000 Ferrari. The Kia clearly gets you from A to B much less expensively than a Ferrari. But few Ferrari drivers are likely to be caught dead in a Kia and plenty of Kia owners would love to be driving Ferraris. The real question is what jobs do the Kia and the Ferrari get done? The Kia is more about the pure utility of getting from here to there where a Ferrari, it could surely be argued, is more about my economic and social status. It is about "who I am." While it will vary from person to person, a Kia might be 90 percent utility and 10 percent identity but a Ferrari might be 20 percent utility and 80 percent identity. Customers who put less emphasis on identity obviously place greater value in the utility of using the product and vice versa. 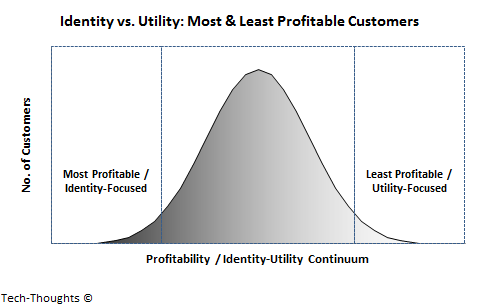 This implies that the entire customer base for the product category lies on an identity-utility continuum, as depicted on the curve at the beginning of this post. From the example above, it is obvious that identity-focused users are usually very resistant to any shift in the basis of competition (unlike utility-focused users) -- a cheaper, improved Kia would never draw customers away from a Ferrari. Traditional analysts use this concept to draw an immediate parallel to the smartphone market, where iPhones (or Galaxy flagships) are Ferraris and low-end vendors are Kias. The problem with this comparison is that the steep price and limited ownership of the Ferrari is integral to the economic and social status granted by its purchase. If Kia owners could afford Ferraris, the benefits of owning a Ferrari would be far more muted, even if the product itself remains unchanged. Among customers who pay $100,000+ to purchase a Ferrari, the proportion of identity-focused customers is undoubtedly 100%, i.e. the distribution of customers is strongly skewed to the left side of the curve. The situation in the smartphone market is different -- Among Chinese buyers who pay $800-$1000 for an iPhone/Galaxy flagship, the proportion of identity-focused customers is likely to be much lower than that for a Ferrari, but still very high compared to the smartphone market at large. On the other hand, US buyers who pay $0-$200 for an iPhone/Galaxy flagship are likely to have a much smaller proportion of identity-focused customers. Of course, given Apple's brand cachet; its overall user base may be more skewed towards identity as compared to Galaxy users. But because of major disparities in pricing, the biggest differences in customer distribution across the identity-utility continuum are by region. An analysis of this regional distribution is imperative to understand shifts in basis of competition and profit trap mechanics in the smartphone market.